Heat the oil in a large 1.7 L/3 pint ovenproof dish, add the onions and garlic. Cook for 2-3 minutes. Add the paste and lamb. Cook for 4-6 minutes, stirring occasionally. Add the water. Bring to the boil, reduce the heat, cover and simmer for 2 hours. 20 minutes before the end of the cooking time add the apricots. Cover and continue to cook for the remainder of the cooking time. Garnish with the coriander and pomegranate seeds and serve with steamed couscous or rice. Brown the lamb in a pan, I did this in a dry pan to avoid adding additional fat to the dish, but you can use oil. Place all ingredients except the pomegranate seeds and coriander in the slow cooker. Cook on high for 4-5 hours or on low for 8 hours. Tip: This recipe works well in a low oven at Gas mark 3, 170 degrees Celcius, 325 degrees Fahrenheit. 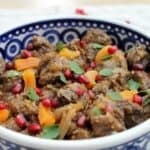 Place all ingredients except the pomegranate and coriander in the slow cooker. Cook on high for 4-5 hours or on low for 8 hours.